It’s an interesting time to be alive, isn’t it? Technology has really changed the world. We now have the power to control things in our home from a world away– we could literally use a smartphone to turn on lights in the living room to look like we’re home even if we’re on a different continent. That’s pretty amazing if you think about it for a moment. What are some benefits of home automation? For starters, home automation allows for things such as appliance and lighting control such that a person can check to make sure things are “safe” and “good” at home, even when they’re not physically there. Want to make sure the oven is off? You can. Want to turn on lights to make the house look like someone’s there? You can do that, too. Next, automatic door locks can be activated to make sure no one gets inside whom you do not want getting into your house while you’re away. That said, if you have a maid coming over and want to unlock the door for her, automated programming can help accomplish that task. Security cameras can be setup and then monitored, allowing you to see various places around your house and property, helping assure you that it’s both safe and secure. Many parents use their home automation systems to keep tabs on their children. 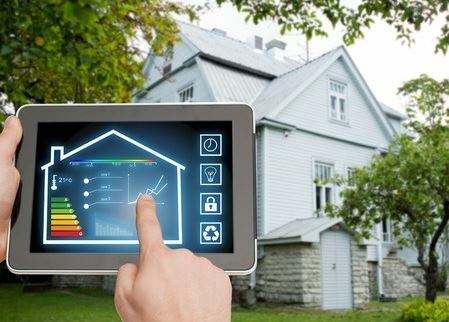 Home automation can also make your heating and cooling bills cost less money, since temperatures get automatically adjusted as programmed and needed. For instance, if you’re not home during the day, why have “the air” on if no one needs it? “Set it and forget it” is many automators’ mantra. Ultimately, automation helps people save money as well as time. It not only helps give people peace-of-mind, but also takes care of “the little things” freeing people up to deal with other more important or enriching issues in their life. With all the things on most people’s plates, isn’t it nice to know certain aspects of running a household can literally be automated in a way that benefits the people living in that home?